Las Vegas is an animal which shape-shifts as night turns to day. As you’ll read in part one of this article, Downtown Vegas and its heartland of Fremont Street, while away from the pomp of the Strip, still blazes with all the gaudy and glorious brightness you’d expect. By night, with its glow at full force, it’s an unforgettable first impression, but as the sun rises on East Fremont we are presented with a different beast altogether. Vegas is changing, and the trendy streets of East Fremont are the frontline for this rejuvenation. Described as ‘the Shoreditch of Vegas’, which may ring with a sour note in the ears of any Londoner (thought it’s pretty clear what they’re going for), East Fremont has almost completed its transformation from an area tourists would avoid entirely, to the scene of a new kind of Las Vegas experience. 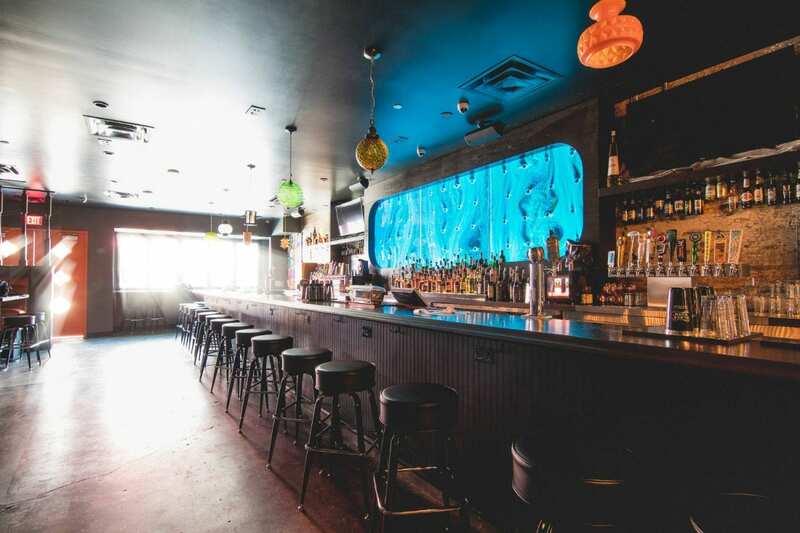 In recent years efforts have been taken to open new bars, restaurants and venues in the area. The result has been a new flavour of Vegas made with the love of its locals, for its locals. Where the Strip, serving as the main drag of the Vegas experience (expect the biggest hotels and the biggest casinos here, all drenched in neon), revels in the culture of gambling, gangsters and excess, East Fremont is more forward thinking. Here in Downtown, the community are seeking to create a new cultural touchpoint in the city. In short, what this means is the place has some seriously hip bars, clubs, restaurants and venues for the growing masses of tourists who might find the mainstream glamour of Vegas too on-the-nose. Of course, the area is still a spectacle. As you enter East Fremont it’s hard to ignore the enormous, fire-spewing Mantis construction, which sits on look-out duty at the gates of the newly built Container Park. 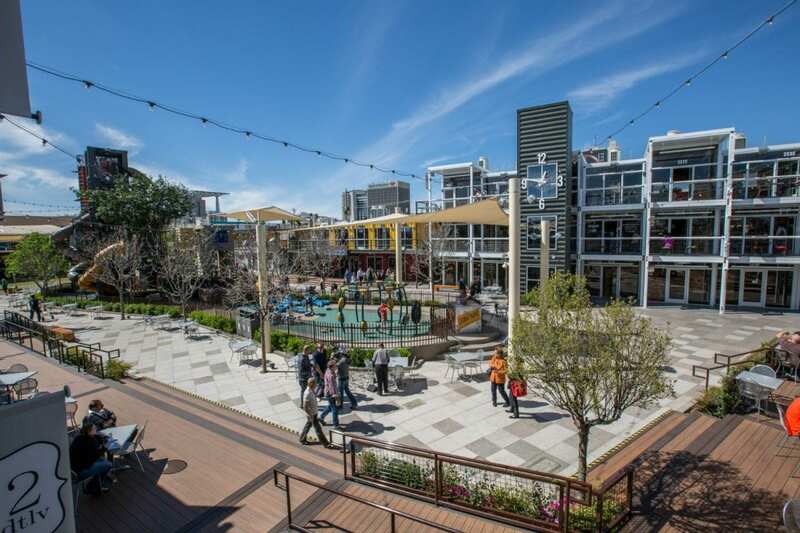 It’s an open-air spot, where visitors can shop, eat and enjoy some entertainment away from the usual Vegas fare. You won’t find any chains or big business here. 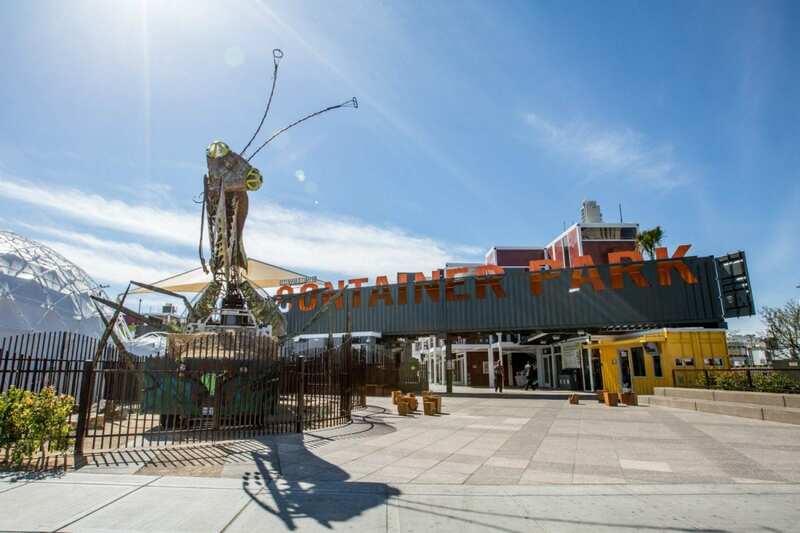 The focus of the rejuvenation is to give local businesses a platform to succeed, and the Container Park is playing its part in giving smaller outlets a chance to get their wares in front of plenty of people. Here you can grab some home-cooked bites at Big Ern’s BBQ, stop in for a high-end sharpener at the Oak & Ivy, and do some shopping around the boutique-style Third & Arrow, which sources unique pieces from local brands. On the day I visit it is a gloriously sunny day in the desert (of course), and the place is buzzing with people. Beyond the Container Park, professional street art spills out onto buildings through East Fremont. As we make our way through the streets, enormous and vibrant murals await on most corners, some pleasingly blasted by the desert sun, while others pop from the walls as if freshly painted. The pieces first started popping up in the area with the first edition of the Life Is Beautiful Music Festival in 2013, which appears to have kickstarted a playful subculture in the area, and has since attracted the attention of artists like Doze Green, Ben Eine, Interesni Kazki, Alexis Diaz and even Shepard Fairy, though I was unable to hunt down his work before the end of the trip (second visit needed). On our way we stop in at a number of bars, though it’s a little place called Corduroy which sticks in my mind as the perfect intersection of this New Vegas thinking with Classic Vegas spectacle. Corduroy has one foot in pleasing rock n roll-bar sleaze and modern venue chic. The bar is happily low-key, with liquor and lights clamouring across the walls – a good place to sink a few with friends for sure – before heading into the neon-drenched lounge in the back. Here it’s dancing or reclining – there’s no in-between, and I can imagine the place being absolutely insane in the early hours of a stifling Vegas morning. 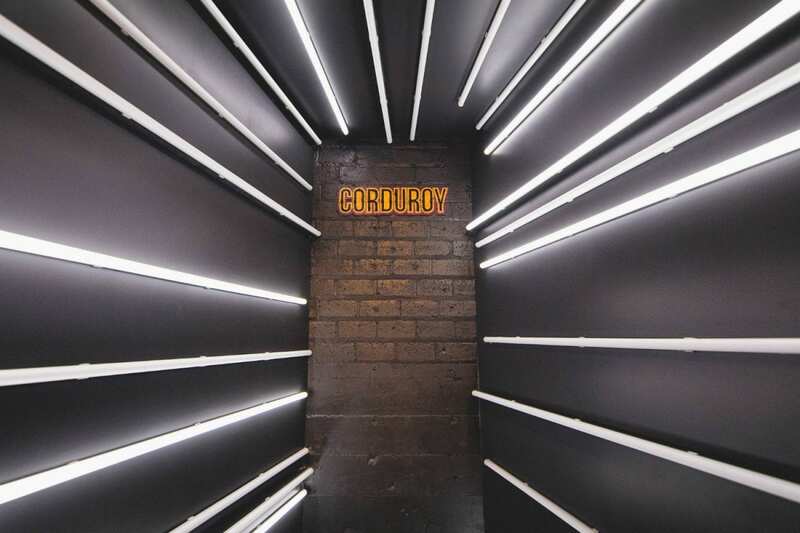 For those looking to escape into their own world entirely, Corduroy has an odd little room called the Lightbox, which feels a bit like what the jump to lightspeed would be like, only with tunes and tipples. If we’re talking about new experiences for Vegas’s tourists, this feels like something of a must-see. However, if that sounds a little too fun for a pre-dinner activity, East Fremont also offers a delicious dichotomy of haute-cuisine meets classic American grub. If you’re tastebuds are feeling indecisive, try out a Lip Smacking Foodie Tour of the area, which will deliver you to tables in some of the favourite local hot spots, including the Carson Kitchen, headed by ‘Rock n Roll chef’ Kerry Simon, for some mini-dishes of reworked American staples. As a socially uncomfortable Brit, the idea of having my dinner split across five different destinations while mingling with total strangers gave me plenty of reasons to feel trepidation, but it turned out to be a mix which really worked. As a way of sampling the tastiest morsels in Downtown it’s great, as well as taking in the surrounding area as the sun sets and the vibe on the streets begins to cool. Introducing tourists to this new East Fremont subculture is the goal of tours like this, and the tour strikes a balance between a truly diverse feast and the ever so slightly boozy social chemistry which sparks when strangers get together across the dinner table.